These phonics posters are comprehensive to help students gain phonemic awareness. Also, I include instructions how to print 4 per a page, so you can use them for phonics activities like a game of go fish, reference cards on a ring during guided reading, and more! 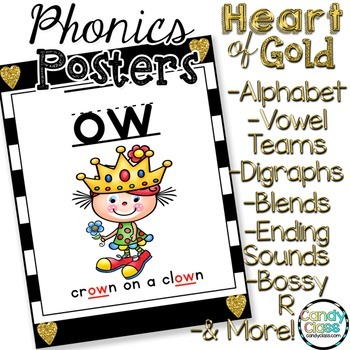 These Phonics Posters are a collision of my original Sound Charts and Chants and the popular design from Heart of Gold Teacher Binder! These are super versatile! Not only can you use them to lead chants and introduce new sounds during morning meeting, but did you know you can change your pdf print settings (instructions in preview and in the resource) to print 4 charts per a page for playing card games and more? Other ideas include using these for word walls or as references in literacy centers. You can use these during guided reading as a teaching tool. You can also project this pdf on the board with a projector and scroll through them. 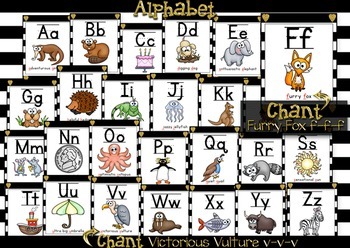 These can also be used as alphabet charts or also known as alphabet posters for the wall. This resource is very handy in building phonemic awareness with phonemes and graphemes! 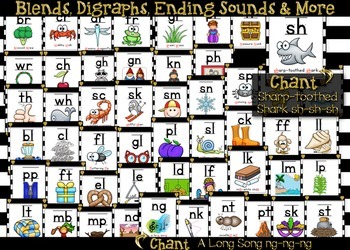 These phonics posters consist of 130 charts covering 130 phonological sounds! This resource is for personal use only and one license is for one classroom. Also note, the phrases on the cards combine to form a poem, so they are protected by copyright.